For 60,000 years aboriginal tribal groups have roamed the broad savannah and pristine coastal regions of Cape York Peninsula. Each group used a different dialect and jealously guarded their exclusive territory but yet they all lived in relative harmony. Another tribal group inhabited the reef-strewn Torres Strait islands. These people came from the Pacific Islands 2000 years ago and they still remain culturally distinct from mainland Aborigines. Travellers to the peninsula see evidence of this rich heritage today in the dramatic escarpments around Laura. Prehistoric sandstone rock art decorates many hidden caves and rock shelters. This style of art is called Quinkan, an Aboriginal name derived from the human-like spirit figures with oddly-shaped heads. The tall skinny ones are ‘good’ spirits and the squat, knobbly-kneed ones are ‘bad’. European history dates from 1600 when Dutch navigators, including Abel Tasman, explored much of the coastline. In 1770, Captain James Cook mapped the eastern coast and claimed the continent for England at Possession Island, just off Cape York. Ludwig Leichhardt passed through the lower peninsula during his 1845 expedition to Arnhem Land and Edmund Kennedy traversed the eastern coast three years later. 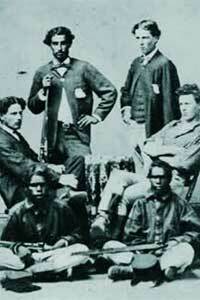 Kennedy's party was continually attacked by Aborigines and only the guide, Jacky-Jacky, succeeded in reaching Cape York. John Jardine became the governor of the northern outpost of Somerset in 1863 and his two sons, Frank and Alick, drove a mob of cattle overland from Rockhampton, a remarkable achievement for those times. Frank became famous for his exploits including finding treasure in a Spanish galleon wreck, kidnapping and marrying a Samoan princess and saving many lives when the ship Quetta sank off the Cape. 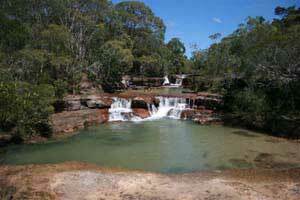 Gold was discovered on the Palmer River in 1873, which led to the growth of Cooktown, Laura and Cairns. The first settlers, prospectors and hard-driving stockmen were rugged individuals. They had to be, to survive in this unforgiving land. The Overland Telegraph line from Cooktown to Somerset was completed in 1887 and this route remains the main road to Cape York.Today, visitors can readily access Aborigine lands by obtaining a temporary permit. A number of Aborigine Land Councils and also cattle station owners, are becoming involved in tourism ventures to cater for an increasing flow of adventurous travellers. The region has had a colourful history but as you travel through it, you realise that mankind has barely touched this remote wilderness. Cape York Peninsula still remains as a wedge-shaped slice of untamed natural beauty.